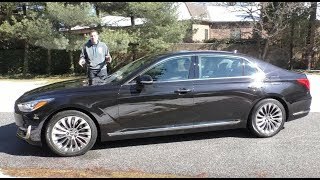 At the Detroit Auto Show Hyundai shared its luxurious, elegant and sportive Hyundai Genesis G90 2017. Targeting the market created by Toyota, Lexus, Nissan and Infiniti, the automaker has undoubtedly created this gem of a piece. The model features a luxurious interior and a sportive and elegant body design. 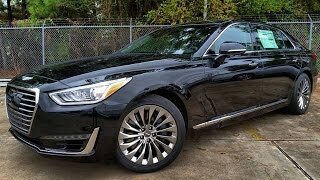 Let us have a look at the detailed review of Hyundai Genesis G90 2017 to know in detail about it. The interior of Hyundai Genesis G90 2017 takes a lap ahead of the predecessor Equus models. Bringing in the essence of Italian and Nappa leather with rear wood trim work the interior looks highly luxurious. The dashboard, center console and the upper part of door panels feature aluminum inserts while the seats come with 22-way power adjustment for driver and 14-way adjustment for the passengers featuring contrast stitching. Talking about the tech upgrades, it has Smart Posture Caring System for the seat, head-up display and side mirrors for better driving experience. Apart the model comes with a 12.3 inch touchscreen, parking camera and minimum body vibration features that make it more loveable. Thus rounding up the interior details of Hyundai Genesis G90 2017 we can say the new release and the badge will sure go mile ahead of its predecessors. 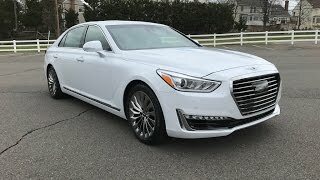 The exterior of Hyundai Genesis G90 2017 is based on design language called ‘Athletic Elegance’ and believe me it is designed in the way it is named. Starting with the front fascia it has gorgeously designed set of headlamps marching their way till the front fenders. Amidst them is the traditional grille while the lower section has a beefy bumper with chrome inserts imposed in it. Moving towards the rear end, the sportive touch continues. There are muscular rear haunches and large glass area for the rear doors. The rear windscreen is also steeply rakes while the deck at the rear portion gets a shorter look and the taillights find a vertical position. Thus rounding up the exterior details of Hyundai Genesis G90 2017 we can say, the luxury found the sportive yet elegant path. Beneath the hood of Hyundai Genesis G90 2017 will be two powertrain options; first one is a 3.3 liter Twin-Turbocharged V6 generating total output of 365 hp and peak torque of 510 nm while the second is a 5.0 liter Direct injection V8 cranking total output of 420 hp and peak torque of 520nm. Both the engines will mate to eight-speed electronically-controlled automatic transmission with lockup torque converter. 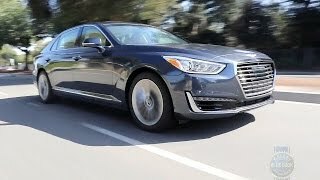 The performance figures of Hyundai Genesis G90 2017 are still not shared but we expect them to have somewhere close to the final launch release of the model.